Oversized loads present a wide range of challenges when it comes to transportation. Often exceeding the allowable legal dimensions for standard transport, you need to work with an experienced and specialised oversized load transport team to move your load safely and efficiently. At Hevi Haul, we specialise in oversized and heavy load transport across Perth and Australia. With years of practical experience and knowledge, we have an in-depth understanding of wide load transportation requirements and standards. As one of Australia’s most reliable and trusted heavy and abnormal load transport companies, let us transport your load with precision and expertise. Our services are backed by a reliable fleet of sturdy movers and trailers designed to make oversized load transport and heavy haulage simple. With some of the biggest and strongest wide load trucks in the country, moving virtually anything is possible with Hevi Haul. We utilise prime movers, flat top trailers, drop deck trailers and floats to move loads of various sizes across Perth and interstate. We’re able to carry loads of over 190 tonnes, up to 9.5 metres wide and up to 55 metres long. All of our vehicles are equipped with the latest technology and are maintained to strict high standards between journeys. Receiving regular servicing and checks, we’re able to ensure minimal downtime and complications to ensure that your load is delivered on time. Our professionals understand that business extends far beyond city or state boundaries. Working with national companies with locations and sites dotted across the country, we offer Australia-wide transport services of heavy and oversized loads. From Perth to major eastern cities and back again, our logistics professionals make transport simple, straightforward and predictable. 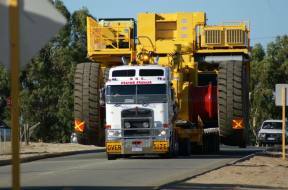 Liaise with only one partner for your oversized load transport across Australia. Choose Hevi Haul to move your loads with professionalism and reliability. When it comes to oversized transport and heavy load logistics, a variety of challenges and complications arise. While standard loads can easily be moved on roads with minimal fuss and preparation, some additional planning and expertise is required for larger and oversized loads. At Hevi Haul, our professionals draw upon over 20 years of experience to effectively plan and execute moves of oversized loads interstate and across lengthy distances. Offering strategic solutions, we’re able to discern ideal vehicles and floats, identify the most efficient and safe routes, secure additional escorts, complete road closures and surveys, organise cranage, jacking and skating and arrange permits and approvals from government departments and authorities. In addition to end to end transport services, Hevi Haul also takes care of traffic management to ensure your oversized load is moved with maximum safety and efficiency. We’re able to arrange pilots and police escorts as required and complete traffic management processes to minimise disruption to other road users. Our experienced and qualified team uphold strict safety standards while ensuring that your delivery stays on schedule. With extensive experience moving oversized loads, our professionals anticipate problems and complications and mitigate risks with effective planning and strategies that consider all stakeholders. If you’re planning an oversized load move, choose a company with proven expertise and experience. At Hevi Haul, we’ve done it all before. We regularly find innovative solutions to complex and unusual oversized and heavy load transport jobs to deliver loads on time across the country. Working with a strict focus on safety, we craft personalised solutions to suit your business requirements. Get started on planning your oversized move. Contact us on (08) 9356 9799.